My views on managing change were forged by the 14 months I spent on the Mercedes Benz South Africa (MBSA) project. The project ran for a few years commencing in 1995. The date is relevant as the country had just started taking its first steps as a full democracy and the memory of the apartheid years was fresh in the minds of all and especially in the minds of the local labour force, most of whom had borne the brunt of some of the worst parts of the apartheid regime. The project was a large transformation project affecting most areas of the business. Success could only be achieved if the workforce supported the transformation and based on the countries recent history, this level of trust would be very difficult to achieve. To be clear- this article in no way implies that MBSA supported or endorsed the apartheid regime. Rather the difficulties I refer to were experienced by the workers on a daily basis just by living in the country. A project team was assembled with experts flying in from all over the world. MBSA allocated approximately 70 staff full time to the project. We kicked off the project with a three day off site conference. The agenda was to ensure that everyone on the team understood the vision and the methodology and toolsets we would be using. There was also time for team building, normally over a bottle of Meerlust Rubicon (77), a particularly fine wine. The project followed the normal course of any large transformation. Data collection, analysis, visioning etc. Interlaced through this activity was a change management program. This program employed a number of communication mediums including everything from posters and brochures to live theatre to town hall meetings. The posters and brochures were professionally produced, multi lingual and widely distributed. The theatre was delivered by professional actors. The themes were designed to mimic how MBSA treated their customers and the consequential customer reaction. It was very confronting. This theatre was played out in all locations all over the country. It told the story of why change was necessary. The town hall meetings were carefully managed affairs often held at an outside venue. The conference rooms were transformed with MBSA branding and when you stepped into the room, you knew you were somewhere special. The meetings were also held all over the country so every location felt included. This means that MBSA often had the entire transformation team and scores of staff and management driving or flying hundreds of kilometres. The cost would have been enormous. Typically an event would have 500 people in attendance. The intent of the communications package was to ensure that everyone in the organisation was aware of the need for change, what could be expected from the project and how they could communicate their concerns back to management. For mine the crowning moment of the change management program was when the trade union members stood up, unannounced at a town hall meeting and started singing songs of support for the program. What was once an adversarial relationship was quickly becoming a relationship based on respect and a common desire to address the issues in the company. It was a highly emotional moment and instantly became my benchmark for what a well orchestrated change management program could achieve. A well funded, well staffed, cohesive project team. Management went to the people. (Staff were not called to a head office presentation). Willingness to actively listen and respond to feedback. In the time since that project, I have not seen another like it. The major difference between MBSA and subsequent projects I have witnessed is the restriction on time and money. Project leaders almost always acknowledge the need for a dedicated change management program but frequently this desire does not translate into sufficient funds, time or active engagement from the leadership. There are two dimensions to change management. The first is to engage the hearts and minds of all stakeholders. The focus is on establishing a common and pervasive understanding of the need for change and ensuring that each person is aware of their responsibility in assisting change to happen. The second is actually changing the behaviour of the individual. Even with a comprehensive change management program, it does not mean that individual will actually decide to modify their behaviour. The first dimension is the organisational level view; the second is recognition of each individual in the business. Effective change management at the organisational level requires that the business give it a formal mandate. This means that its importance is recognised and that it has a formal structure. An effective change management structure typically has four levels. The steering committee sets the project strategy and ensures the projects are delivering change in line with the strategic intent of the company. 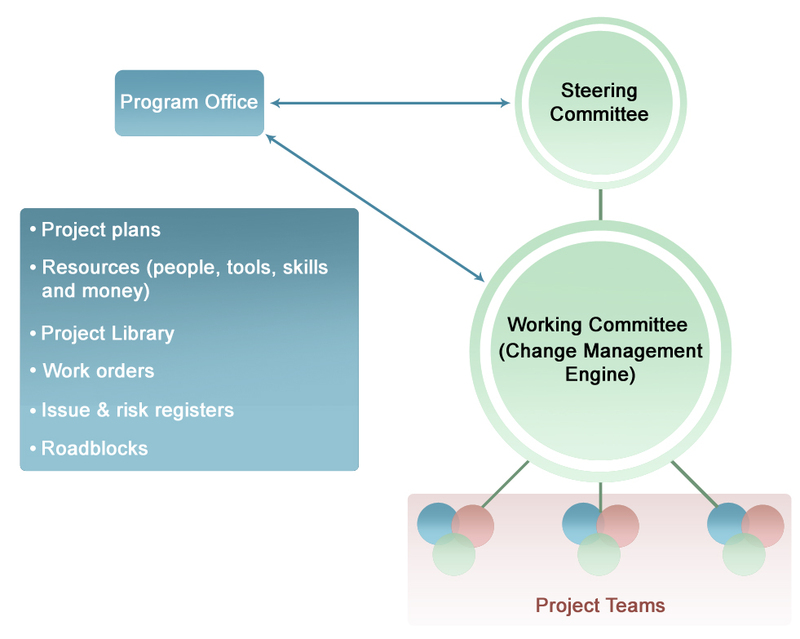 The working committee is the primary engine for driving change in the business. Its purpose is to establish and manage the project teams that will gather and synthesis data and then to discuss this data and make recommendations to the steering committee. 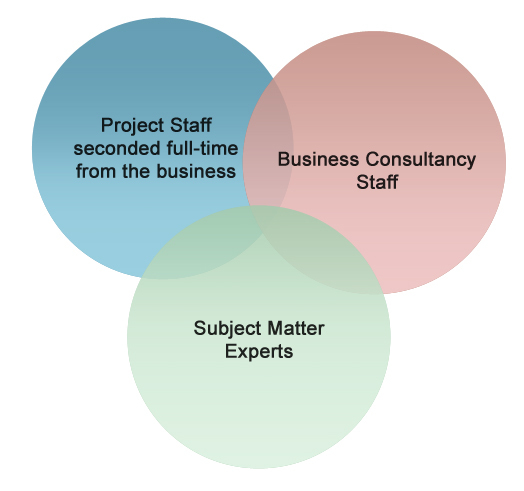 The project teams are task focused groups, typically made up of staff who have been seconded full time to the project, part time subject matter experts and business consultants who may provide methodology and other specialist skills. 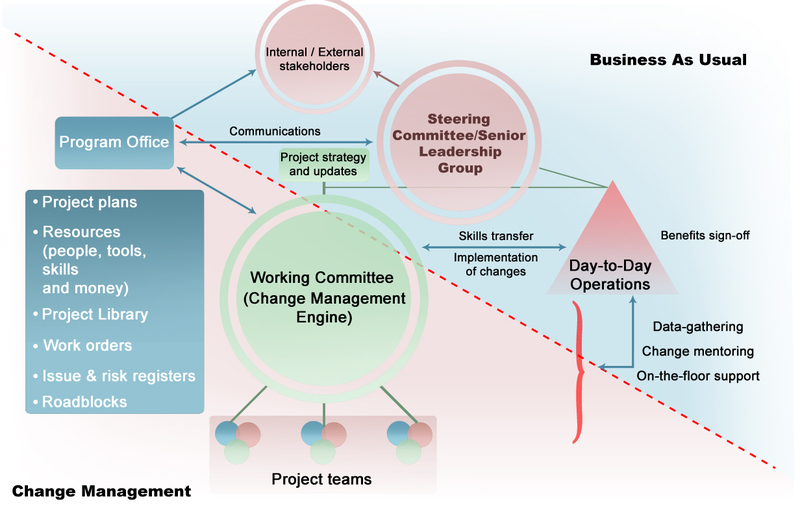 The program office ensures this change hierarchy is managed for success. It provides the tools and resources and allocates the budget to ensure the desired outcomes can be achieved. It should restrict its role to librarian and score keeper. It is not on the field of play, but watching the play. This ensures that it does not inadvertently impede the business from taking ownership of change. It is important to note that the business provides the budget. The program office allocates the budget. The project teams can either be orientated by function or service line. Eg, a finance team that examines everything in finance, or a process team that examines all processes in the business. In the former, the subject matter expert is the process person and in the latter the subject matter expert is the finance representative. I consider it essential that one of the project teams is a communications team with the sole focus of communicating the ‘project’ to the business and ensuring that the business can communicate with the project. Business as usual gets on with running the business and the project teams engage with the business to better understand the issues and discuss improvements. If the business is willing to fully formalise this approach then the above structure will include a corrective action team (CAT) as a second essential project team. The various project teams can come and go as required, but the CAT and the communications team become permanent fixtures. To provide some detail behind the communications and corrective action team. Many project leaders I speak to consider their projects to be too small for such a formal communications management role. To mitigate this constraint, the communications process should still be formalised but the staffing becomes part time. I learnt a long time ago that the formula for rumour is – ambiguity x interest. With a project there is always interest. Good communications will dilute the ambiguity. There are two aspects to preparing a structured communications package. These are; the message itself and the management of the message. Each has sub attributes. For the message consider: Who is going to read the content and why is it relevant to them. What is the level of accuracy required? Will broad brush statements suffice or is it important to include numbers to the second decimal point. When is the information needed and how will it be accessed. If there are questions who do they turn to for support? The answers to the above questions will determine the physical attributes of the message. A senior executive is accustomed to working with electronic messages anywhere in the world. A factory worker may want to be addressed personally in a town hall meeting where they can evaluate first hand, the ‘trustworthiness’ of the messenger. Management of the message includes answering the questions; Where does the raw data come from? How do I reply to it? Where can I access it at a later stage? To briefly summarise the concept behind the corrective action team. The business gets on with day to day operations. When a non conformance (non conformance to requirements) is identified through normal business activity, then it is up to the management structure to address the issue. In the event that they are not able to permanently resolve the underlying issue that caused the non conformance, then they will raise a CAR (corrective action request) and lodge it with the CAT. The CAT will work with the other project teams to fully diagnose the underlying issue and will recommend actions up to the working committee to permanently resolve the problem. The working committee reviews and endorses the recommendations and the business is asked to implement the change and to monitor its effectiveness. The project teams should assist with implementation. As this corrective action process gets better and stronger a culture of continuous improvement emerges and the change management structure evolves and transforms from being a vehicle set up to deliver a project to become a vehicle that delivers excellence in the business. This brings us to the second dimension of change management – changing the individual. The mechanistic stage is the toughest. This is when an individual is most resistant to change. They are questioning the relevance of the change and often say that while they fully support the change, it does not apply to their role. Often staff will attend meetings or training on the new approach and be positive in the session. Afterwards they return to their work area and will tell their staff – “that’s all rubbish, those folk in their fancy suits don’t know talking about and it will never work here. We will continue doing what we have always done”. To resolve this mindset the change manager needs to work with the individual staff members and often the best approach is JFDI – ‘Just do it’. The individual is forced to comply. S/he does not have to fully understand why the change is important, they only have to adopt the new way of doing things. Over a period of time, could be hours, days or weeks, the penny will drop and the staff member will start to see the benefits of doing it the new way. This is stage 2 – conceptual understanding. At this point they will start to introduce positive improvements and customisations to make the changes more relevant and appropriate to their area. As this happens they move to stage 3 – Adoption. They now have full ownership of the changes and consider them their own. Asking them to make further changes at this time becomes difficult as they will be back to stage 1. To move a person through these three stages requires extensive ‘on-the-floor’ support. The change agent needs to working with the business on a daily basis to help implement the changes. Identify those staff that can work in the new way of doing things and will who work with you and use them as change leaders/role models. These staff require the least amount of effort. Staff that Will work with you but lack the skills to do so (Can’t) are the next easiest group. Their mind is open and they are willing to learn. Give them training and mentoring to embed the new routines. It is important not to under estimate the amount of time these staff need to embed the change. Without ongoing mentoring, the changes may become too difficult and the person may slip into the Won’t/Can’t category. The third category is Can/Won’t. This person has the skills to work in the new way but is resistant to doing so. They are firmly entrenched in stage 1. This person is most dangerous to the change program. Other staff will watch how this person is dealt with and may take their lead from him/her. This person requires extensive on the floor support and the JFDI approach should be strictly enforced. If you can switch this person from a Can/Won’t to a Can/Will, then you may have the best change champion you could ask for. The last category is Can’t/Won’t. This person needs counselling to help them understand their position and extensive on the floor support. If they do not show signs of moving to Can/Won’t or Will/Can’t then they are probably not suited to that role. The platitude is – “if you can’t change the people, change the people’. Unfortunately this is sometimes required. The typical progression between categories is shown. It can be said that the only time change is real is when it is at the level of the individual. Concepts such as ‘organisational change’ or ‘business transformation’ are valid phrases and have specific meaning. But they can also be misleading. Businesses don’t actually exist. They are legal constructs. What exists are the elements of the business – people/plant/machinery/money etc. To change a business means that you need to change the relationships between the elements and ‘People’ refers to the staff members and this means actual change takes place at the individual level. Engage the hearts and minds of all stakeholders. Use this dimension to address the Will/Won’t aspect. Get the staff to a mindset of Will. Change the behaviour of the individual. Use this dimension to address the Can/Can’t aspect. This entry was posted in Strategy and Governance. Bookmark the permalink.